Detroit-based start-up aims to challenge Tesla and established truckmakers. Rivian founder R.C. Scaringe shows off the the R1T in Los Angeles — the first of two electric vehicles from the company. Forget those snail-slow battery-powered econoboxes. The electric revolution is taking aim at seemingly every niche of the market, including high-performance sports car and full-size pickups. This year’s Los Angeles Auto Show is likely to take many folks by surprise as they check out the battery-powered options making their debut, a list that includes two new light truck models from suburban Detroit-based start-up Rivian, the R1T pickup and the R1S sport-utility vehicle. “Our goal is to allow you to go anywhere,” said R.C. Scaringe, Rivan’s founder and CEO, as he pulled the wraps off the two new models which, if all goes according to plan, will go into production by the second half of 2020. Like Tesla, Rivian has opted to keep development in-house, breaking from traditional automotive design and engineering. To start with, both models share a skateboard-like architecture that allows their batteries and motors to be housed under the load floor. That approach has a number of advantage, among other things lowering the center of gravity while also maximizing space for passengers and cargo. Scaringe shows off the company's new pickup and sport-utility vehicle — both capable of 0-to-60 in three seconds. Under the hood of the R1T pickup, for example, there’s about 330 liters of storage space, rather than an engine. The truck also has a large cross-vehicle compartment ahead of the rear wheels. It can be used to securely store long items and also serves as a step to make it easy to reach cargo in the truck’s bed. The R1S offers similar storage up front, and its rear two rows can fold flat for more space in the back. “The beauty of a clean sheet (approach) is you can do things … in ways you’ve never seen before,” said Scaringe during a presentation at Automobility a day-long conference marking the start of the L.A. show that is focused on electrified and autonomous vehicle technologies. 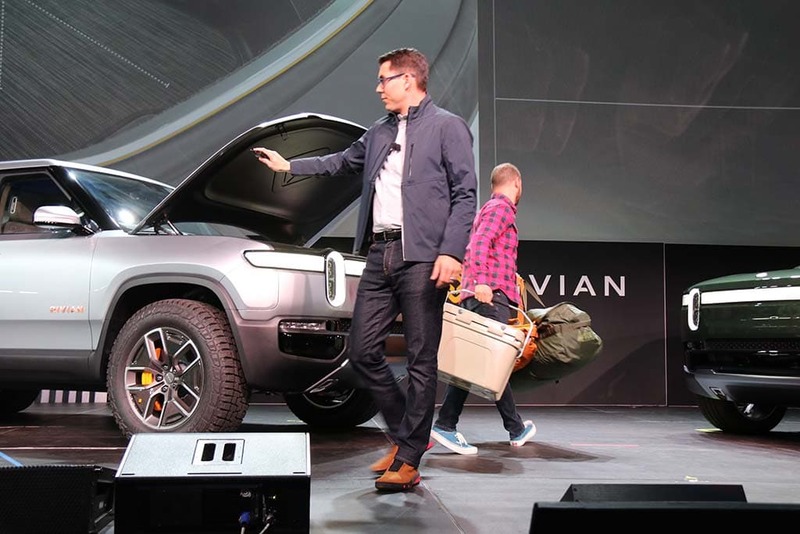 Going with two full-size products, meanwhile, offered Rivian another advantage: plenty of space to package in lithium-ion batteries. At least for the moment, the start-up is aiming to give the R1T and R1S models the largest battery packs ever put into production, a full 180 kilowatt-hours, or 80% more than the capacity of the Tesla Model X P100D sport-utility vehicle. That’s enough, according to Scaringe, to travel more than 400 miles per charge in the pickup and “slightly further” in the utility vehicle. 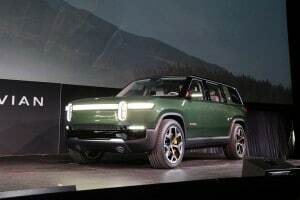 The Rivian R1S can travel more than 400 miles on a single charge. The Rivian founder didn’t say if the company might offer shorter-range options but he did note that the battery packs are comprised of individual modules of 15 kWh, a dozen of them in the vehicles shown at Automobility. Energy will be used to drive four individual motors, one for each wheel, with the two models expected to deliver “close to 800 horsepower” and around 1,000 pound-feet of torque. But power can be directed wherever needed, even to just one wheel, to enhance traction on rough roads or to torque-vector through an aggressive cornering maneuver. Performance will rival a Tesla SUV with Ludicrous Mode, Scaringe claiming the two trucks will hit 60 in 3 seconds and 100 in less than 7 seconds, with a top speed of 125 mph. They will, meanwhile, be able to tow up to 11,000 pounds. 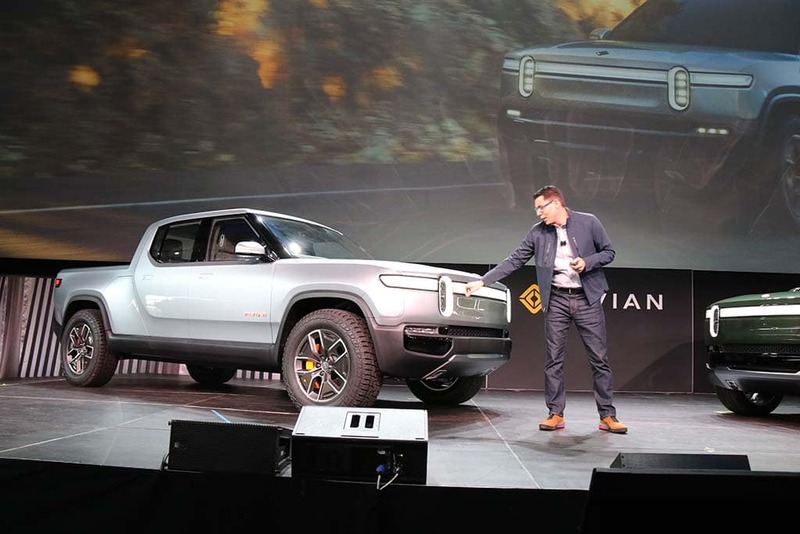 Rivian is referring to the two models as “Electric Adventure Vehicles,” and the company founder outlined some solid capabilities, including the ability to ford up to 1 meter, or about 39 inches, of water. No gas engine means more storage is available in the R1T's frunk. The air suspension the two trucks will share can be raised or lowered from a low 200 millimeters in “Kneel Mode,” to 360 mm off-road. Both pickup and SUV share similar styling, including a distinctive, grille-less face featuring twin vertical headlights and a daytime running light cross-bar that also advises a driver of the car’s state of charge. Scaringe didn’t release details on the charging system though, with a 180 kWh battery-pack, it would take a bit of time to “fill up” an empty battery, though using the next-gen 350 kilowatt Level 3 chargers just starting to pop up across the country that could be cut to around 30-40 minutes for an 80% recharge, according to several experts gathered at Automobility. 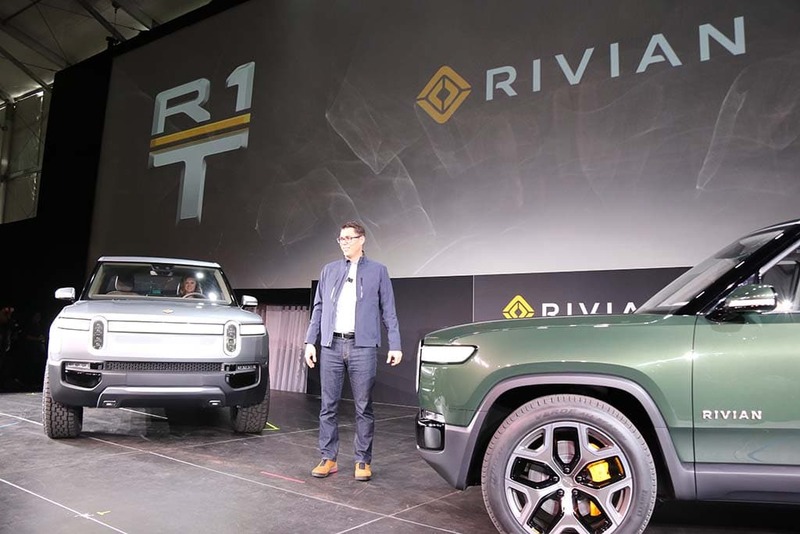 Rivian has yet to reveal the price of the two trucks, nor has it fully outlined its distribution strategy. This entry was posted on Tuesday, November 27th, 2018 at and is filed under Auto Shows, Automakers, Automobiles, EVs, Executives, Los Angeles, Markets, Personalities, Pickups, SUVs, Sales, Trends, U.S./North America. You can follow any responses to this entry through the RSS 2.0 feed. Both comments and pings are currently closed.